I always thought that my plus size customers wanted to downplay shape. 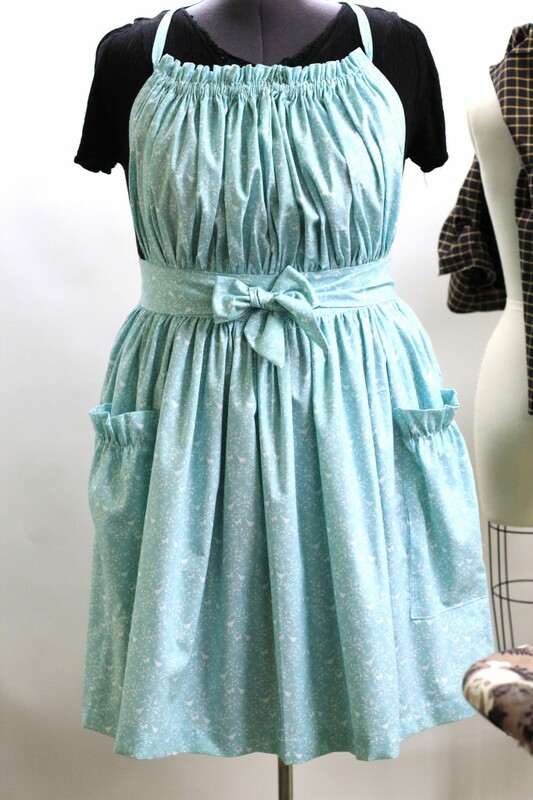 Answering that, and paying attention to cost, I made the Plus Size skirt on those aprons to have less gathers, that way it fell closer to the hip and didn’t make anyone look hippier than they were already. But I was never satisfied with the overall look of it. Making something plus size, shouldn’t be a downplayed version, or adjusted version of a smaller garment. I want it to look the same for them as it does for everyone else. So I took a leap off the cliff so to speak. Plus Size cannot be graded up, (I know there are people disagreeing me here.) To be blunt, if you make a dress for a tree trunk, you can grade it up to make it large enough to go around a big round rock, but its never going to cast the same shadow and shape on both forms. I find that even with something as simple as an apron, I need to drape and cut it from the beginning on the larger form. It may be similar but the balance is greatly different. Some larger woman want to look slimmer. They want cuts that make them look slimmer. But don’t they also want clothes to flounce on them the same way, create shape the same way? 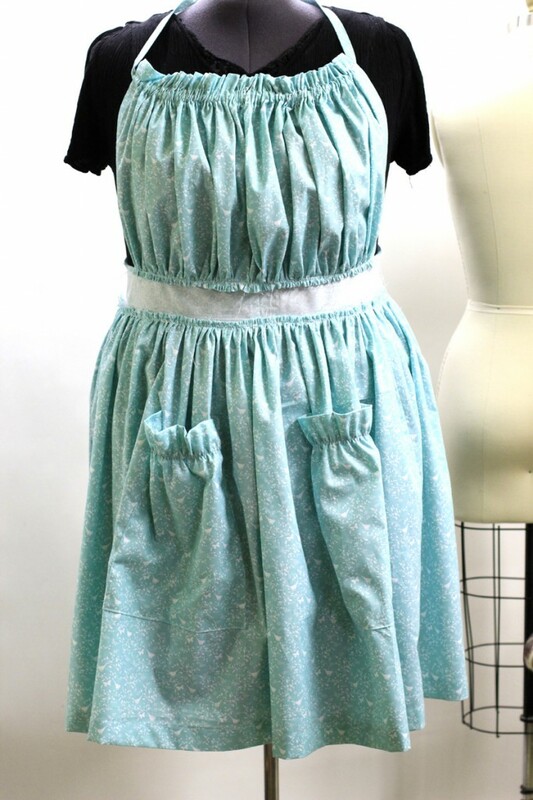 I am taking a leap and changing the skirt pattern to my plus size Aprons. I am no longer giving them less gathers. I am not trying to make them look slimmer. We’ll see how this goes. My customers tell me lots of things. And I love that and it helps me grow my business. But one fact remains, the sales tell me a lot,too. I will see what happens. Here is a shot of my redesign being checked on the dress form. I felt really good with this result. As I looked through the camera lens, I nearly couldn’t tell it was Plus Size, I thought it was balanced so well, that it looked like a regular size but it’s not, Ruby is 60-50-60. I wondered, if the cut was balanced better would you look slimmer? Don’t you look larger when the armhole is down to your waist and the sleeves seam halfway down to your elbow, yet the garment is tight on your stomache? And by the way, that is a traditional French seam you see there on the skirt. No, I’m not going for Couture Aprons, I was too lazy to change the color thread on the serger. Pressing the waistband for the final seam. I always love this part, its the last seam to the final revel of what this is going to look like. I get excited. 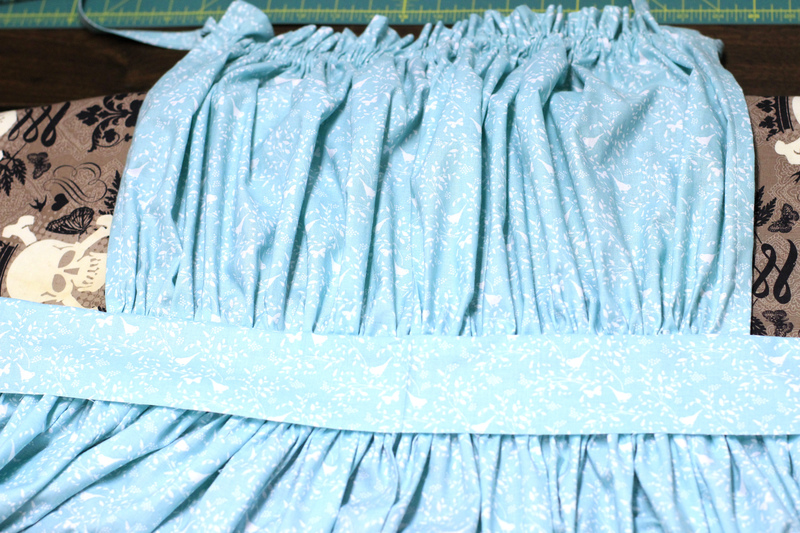 And I do like having the gathers of the skirt balanced with the gathers on the bodice. Love it. I can be happy. Now to make a few more and properly photograph them for uploading. Then I will see if this design change will work. 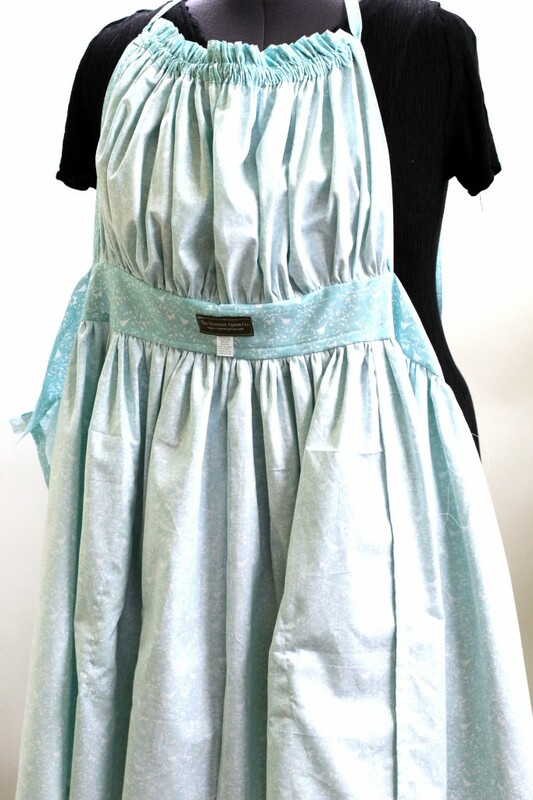 you make the nicest aprons for plus size women. I might buy one sometimes. Thank you! I love feedback.